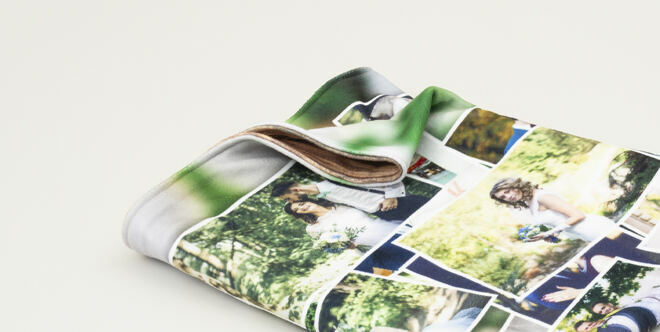 Print your pictures onto gorgeous, plush photo blankets and wrap yourself up in your fondest memories. 570 gsm polar fleece fabric is hand stitched together, resulting in a double thick furnishing gift that will always keep you cosy. Available in four sizes and beautifully printed on one or both sides with your unique designs, this is the ultimate way to snuggle up in style. 100% satisfaction guarantee or you'll get your money back*. 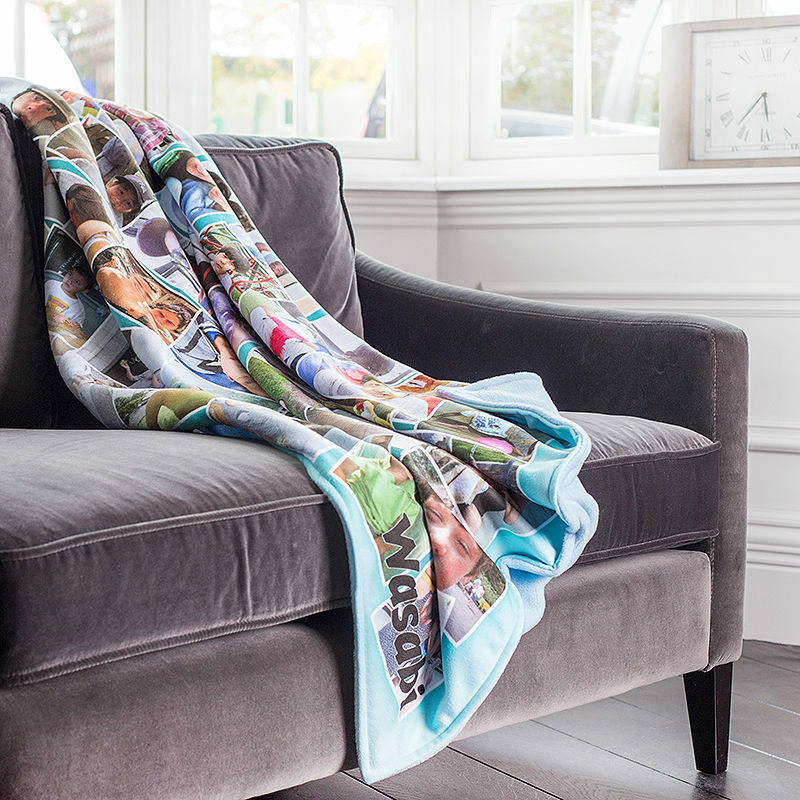 Get snug on the sofa with your custom photo fleece blanket and enjoy the warming hug sensation as you wrap it around your shoulders. Outstandingly printed with special photos, designs or messages, this is a gorgeous gift that lasts a lifetime, coming with a 10-year guarantee on the print, fleece fabric and stitching finish. They are handmade to order in four different sizes, each one crafted and stitched with the utmost care and precision. Print your photos on both sides and essentially get two blankets in one, or simply print on the face and select from four colours for the backing. We have over 13 years of experience bringing your memories to life. I have purchased 2 blankets for others before and always wanted one for myself. So after a lengthy admission in hospital I convinced another patient and myself to buy one! I love the blanket, the quality is amazing and it’s such a comfort for when I feel poorly. Delivery was so quick as well!! The quality of the blankets is exceptional and ordering on line was user friendly they arrived within the time I was told giving excellent customer service with updates about delivery the whole experience was very good for both times I’ve ordered. As a first time customer I was so amazed at how easy it was to create a custom picture blanket! I wanted the product for mother's day but silly me didn't order the blanket until the Wednesday night! I was so surprised to find it had arrived on my lunch break on the Friday! My mam is in love with the blanket I purchased, the pictures on the blanket are of amazing quality and the blanket its self is lovely and thick! It's so much better than what I thought it would look like!! Thank you so much, will be using this website for anything custom i need in the future! Sometimes you just have so many photos, it's hard to choose just one, so why not create a stunning collage design that features all your favourite snaps? Upload a selection of images and apply them all to the blanket in the design interface. Choose from a range of automated montage styles or rearrange and edit the pictures manually. Whether it's photos of family and friends or moments captured from a special event that you want to commemorate, a collage blanket is a sensational gift that preserves your memory in a totally unique way. Treat more people to a personalised blanket and save money at the same time with our three for two offer. Simply add three blankets to your basket – featuring the same or different designs, it's up to you – and the discount will be applied automatically. Your unique photo, text or designs are printed onto the surface of the fleece, where the eco-inks are fused deep into the fibres, guaranteeing the colours and quality won't crack or peel over time. If you've chosen a single-sided blanket, choose from either soft pink, baby blue, black or cream backing. Two layers of 285gsm polar fleece fabric are printed and hand stitched together by our expert seamstresses, resulting in a thick and sumptuous 570gsm double thick fleece, probably the thickest available. Care: Your bespoke blanket is made from responsibly sourced anti-piling fleece, that has a gorgeous plush texture. It can be machine washed at 30°c or lower on a short spin. Leave to drip dry flat or tumble dry on a low heat. Do not wring out. Even with regular use and washing, your photo or designs won't peel away or scratch off thanks to the specialist printing process. That's why we offer a 10-year guarantee on the print life, quality of the material and stitching finish. Please note: As everything we provide is handmade to order, all sizes may have a slight variance. In times of need or sadness, having a blanket printed with happy memories can help to uplift spirits and put a smile on your recipient's face. You can add text, reminding them how loved they are so whenever they're feeling down, they can snuggle up surrounded by familiar faces and kind words. Whether you're looking to add an extra special touch to your soft furnishings or need a housewarming present for friends, printing on this gorgeous fleece blanket gives you total freedom. Make the most of double-sided printing and get essentially two in one. Design each side in a completely different style so you can easily switch up the décor. Whether you use photos of their dog, family and friends, or even print their face, or whether you use a pattern to complement the interior design, the stunning high definition print will guarantee it's a centrepiece of any room. A cute idea is to turn your blanket into a fun, educational resource that your children can take with them everywhere. Print a numbers game, the alphabet, animals or different colours to help them learn on-the-go. Include their name too to make the little one feel special, and more encouraged to participate. Create a snuggly personalised blanket to celebrate a special occasion. A milestone birthday, Valentine's Day, or even Christmas. A fluffy personalised Christmas blanket is perfect for cuddling up on the sofa and watching those brilliant Christmas films through the festive season. Create a personalised faux fur blanket for the perfect style piece or addition to your home. Made to order with 10 year guarantee.